Americans perceive what has happened to their democratic Republic only dimly, tricked by rightists who call all collective government actions bad and by neoliberals who make “markets” a new-age god. But ex-congressional budget official Mike Lofgren shows how this “Deep State” really works, writes Chuck Spinney. Just about everyone knows something is dangerously wrong with our nation’s political system. There is a growing awareness that the United States is drifting blindly into a state of greater inequality, stagnation, oligarchy and perpetual war, with a ruling establishment that neither responds to the will of the people nor to the problems our nation faces. For evidence of this pervasive sense of unease, look no further than the 2016 presidential election, where a bombastic celebrity billionaire and a crusty grandfatherly democratic socialist are claiming the political system is rigged and are driving the scions of the status quo into the rubber room — at least for now. In his most recent book, The Deep State, Mike Lofgren has written a timely exegesis of that status quo and its staying power. He makes it easier for any concerned citizen to understand the realities of the political and constitutional crises now facing the United States — and perhaps even improve the reader’s sense for the madness and anger that now characterizes 2016 presidential election. Before reading further, be advised, I am biased: the author, Mike Lofgren, is a long-time colleague and close friend. Lofgren worked on Capitol Hill while I worked in the Pentagon. 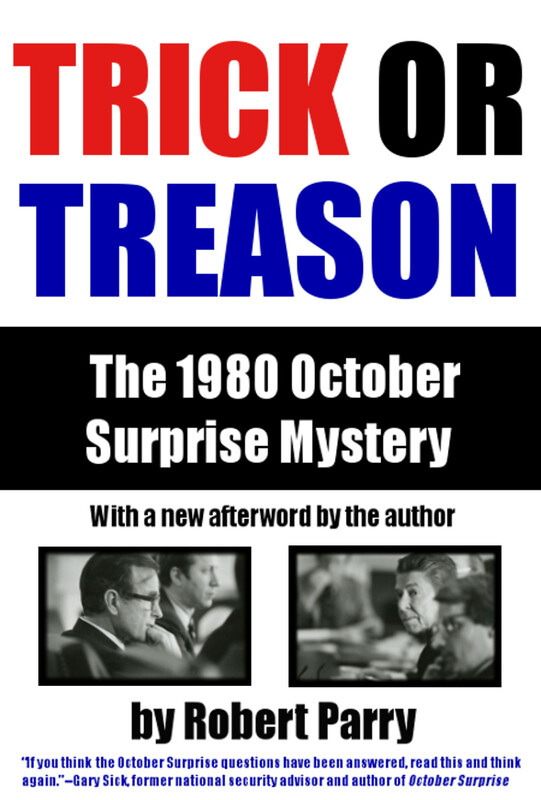 Over the years, beginning in the late 1980s, we discussed and tried to understand the many hidden connections that had evolved insensibly over time to disconnect the money-siphoning operations of the Military-Industrial-Congressional Complex from the system of checks and balances designed by the Framers of the Constitution. Lofgren’s book goes much further. It grew out of a stunning essay “Anatomy of the Deep State” (February 2014), that Lofgren produced at the request of journalist Bill Moyers. Lofgren has written a tour de force that takes the reader on a wild ride through a swamp of confusion and disorder that reeks of corruption. His writing is at once witty and particular, but also general and prescriptive. Making sense out of that mix is no mean feat. To be sure, the story Lofgren weaves is complex, and at times overwhelming and disgusting, but anyone can understand it, if one takes the time to read and think about what Lofgren is saying. Lofgren’s analysis centers on how the looting operations of three mutually reinforcing “pillars” (my word) of the contemporary American Deep State evolved over time. These “pillars” are themselves self-organizing groupings of coincident interests that work to insensibly co-opt and exploit the fissures in the mechanistic distribution of power designed into the Constitution by James Madison. 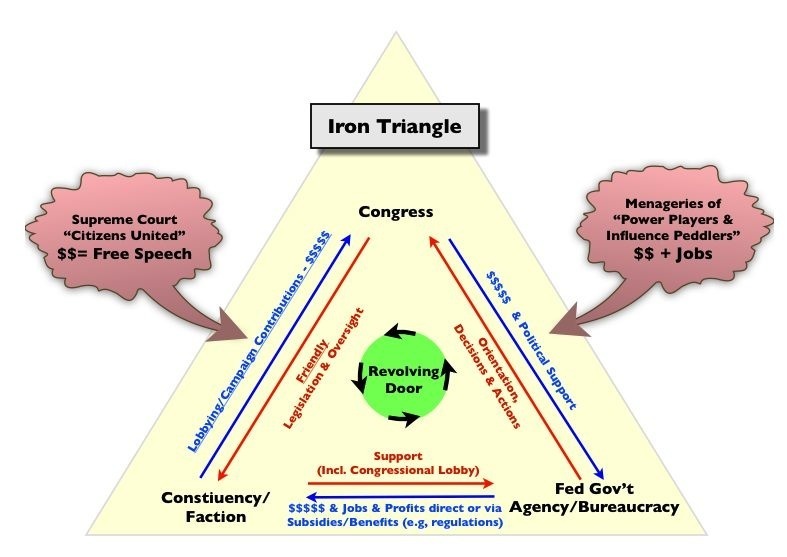 These emergent groupings form what some essayists have called an “iron triangle” of capitalists in the private sector and professional bureaucrats as well as elected officials in the legislative and executive branches of government, as well as in the menageries inhabited by hangers on, wannabees, journalists, and parasites feeding off the triangular host. These triangles are energized by money flows and influence peddling, and their operations are lubricated by a maze of revolving doors that enable the individual players to climb the greasy pole to power and riches by moving freely back and forth from one corner to another, all the while pumping the money and propaganda needed by the triangle to survive and grow , on its own terms! Lofgren’s discussion of the career trajectory and policy actions of Robert Rubin, President Clinton’s Secretary of the Treasury, is a particularly illuminating, if extreme, example of how an adept player games the triangle to accrete fabulous riches and oligarchical power. 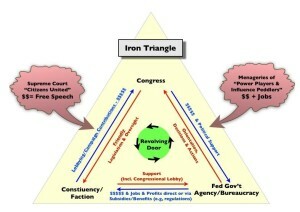 Figure 1 is my simplified schematic outlining the basic features of an iron triangle. Lofgren’s analysis takes us around three triangles by examining the maze of living relationships making up (1) the triangular money pumping operations of the Military-Industrial-Congressional Complex, as well as the more subtle looting and power grabbing operations of (2) the de-regulating scams of Big Finance and (3) the big-brother spying operations of the pseudo-libertarian hyper-capitalists of Silicon Valley. To be sure, there are many other iron triangles that Lofgren does not discuss in great detail (e.g., Big Pharma, Big AG and the food supply, etc. ), but his story is clear enough and sufficiently broad enough to make the larger argument. But there is more. Lofgren explains how the more obvious idea of an iron triangle is only the inner core of a far-reaching web of interests. This web includes, inter alia, the machinations of lobbyists, think tanks, political action committees (PACs), universities, pseudo intellectuals and ideologues, establishment promoting pundits in the fourth estate, tax deductible foundations, and behind them, the deep pockets of the secretive billionaire oligarchs, who have had their influence unleashed by the recent decisions of the Supreme Court. The blood giving life to the inner and outer aspects of this pulsating web of non-democratic power and influence is MONEY, which the Supreme Court in its Citizens United Decision legitimated as a form of free speech protected by the First Amendment. To Lofgren’s argument, I would add the accumulating result of America’s insensible descent into the Deep State is a work in progress. I also argue that this work is being been accompanied by a gradual emergence of a peculiarly American amalgam of fascist, corporatist and neoliberal organizational ideologies. This amalgam is evolving into “winner take all” political economy that subordinates citizens and workers and the state to growing oligarchical powers in the private sector. Figure 2 is a kind of thought experiment I designed to explore the ramifications of this possibility. It lists some of the political and economic features of the fascist, corporatist and laissez-faire (aka neoliberal) ideologies. To be sure, these are murky features, especially in the case of those relating to fascism, but I think most objective readers would agree that the features outlined in Figure 2 are very prominent in each of these forms of political-economic organization. 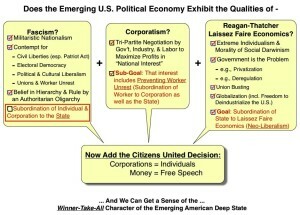 The experiment is to ask yourself if the emergent American political economy exhibits hints of these features. The boxes checked in red are my affirmative answers to these questions. While Lofgren does not say so, I would argue there are growing signs that the emerging American political economy combines many elements of classical fascism and corporatism with neoliberal laissez-faire economics into something that is new and peculiarly American, a political economy that exhibits fascist tendencies, but unlike classical fascism, subordinates the state to neoliberal corporatist interests, while it exploits many of fascism’s authoritarian organizing principles to stabilize the emerging status quo. Don’t take my word for it. Read Lofgren’s book, then think about how you would check or redefine the boxes in Figure 2 and draw your own conclusions. One of the most important aspects of Lofgren’s analysis, at least to my thinking, lies in his frequent reminders that the structural aspects of this current state of affairs are not the results of a centrally guided conspiracy hashed out in a smoke-filled room. 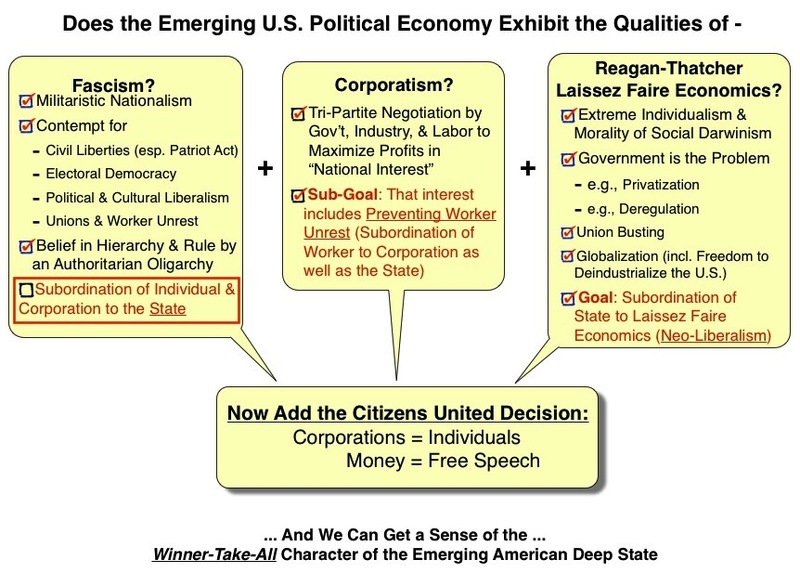 The “structure” of the contemporary American Deep State is more an emergent property triggered by the incremental give-and-take by thousands of players, whose successes and failures are conditioned by an interplay of chance and necessity, in what is really a cultural evolution. To be sure, there are lots of smoke-filled rooms conspiring invisibly to play this game of chance and necessity, but they are competing with each other as well as cooperating — and it is the evolutionary character of the Deep State that enables it to survive, adapt and grow on its own terms, and that emergent character is what makes the Deep State so dangerously resistant to change. It seems to me that this essay misses the elephant in the middle of the room. What about the Fed and, more broadly, the whole system of privately-owned central banks with the privately-owned BIS on top of the heap? Is that not the nexus of power for the global elite? Thank you Abe for your insight on our Deep State versus the constitution. The late Sheldon S. Wolin, an American political philosopher and Professor of Politics, Emeritus, at Princeton University, is known for coining the term “inverted totalitarianism”. In Democracy Incorporated: Managed Democracy and the Specter of Inverted Totalitarianism (2008), Wolin presents an in-depth analysis of the dynamics of â€œSuperpowerâ€ and â€œinverted totalitarianismâ€ manifest in the American corporate state. 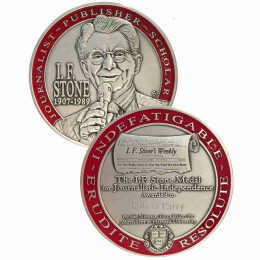 Real investigative journalists such as Robert Parry expose this empire of â€œmystificationsâ€. Peter Dale Scott, “The State, the Deep State, and the Wall Street Overworld,” The Asia-Pacific Journal, Volume 12, Issue 10, No. 5, March 10, 2014. I shall argue that in the 1950s Wall Street was a dominating complex. It included not just banks and oil firms but also the oil majors whose cartel arrangements were successfully defended against the U.S. Government by the Wall Street law firm Sullivan and Cromwell, home to the Dulles brothers. This larger complex is what I mean by the Wall Street overworld. A former Turkish president and prime minister once commented that the Turkish deep state was the real state, and the public state was only a â€œspare state,â€ not the real one. 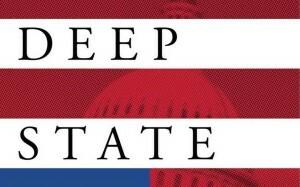 A better understanding of the American deep state is necessary, if we are to prevent it from assuming permanently the same role. Is “Deep State” a term that is inherently conspiracy- (or “covert action”-) acknowledging? The term, as originally used in Turkey, was a conspiracy (covert networks) terminology. 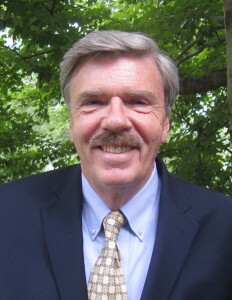 The term was adopted by Peter Dale Scott, a conspiracy researcher. The term was stolen and subverted by former GOP Congressional analyst Mike Lofgren to be a non-conspiracy term referring to non-public-state influences on the public state: like the Koch Brothers or military contractors. Anti-democracy, but legal. This is a perversion of the original meaning. Lofgren’s use of the term completely eliminates any “covert action” meaning. 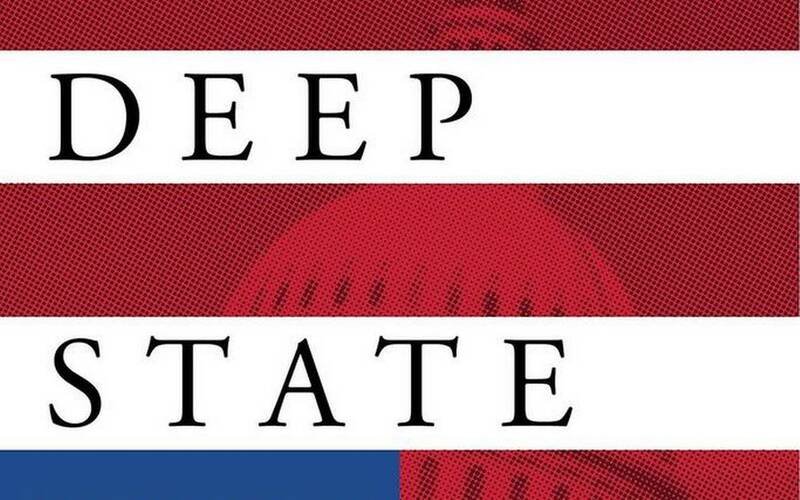 The original meaning of “Deep State” creates an opportunity to legitimize talk of covert networking, by adapting an already-legitimate geopolitical term. The embracing of Lofgren’s alteration of the term has consequences. Bill Moyers and others in the mainstream media have embraced Mike Lofgren & Mike Lofgren’s use of the term. They have ignored Peter Dale Scott’s. They have ignored the Turkish meaning of the term. Is this an “acceptable” (to the Deep State) limited-hangout style co-opting of the term “Deep State”? Is the real Deep State more threatened & more interested in obscuring the covert networks discussion (and the legitimization of such a discussion via an authentic geopolitical vocabulary) than they are in avoiding talk of fascism? Is talk of fascism an acceptable trade-off? Would we find Lofgren able to use his version of “Deep State” to talk about Turkey’s Susurluk Scandal (one of Turkey’s original, and most stunning, “Deep State” scandals)? It is alarming that the “covert networks” and “covert action” dimension of the term has been completely removed by Lofgren yet this is being embraced by figures ranging from Ray McGovern to Dave Emory. Peter Dale Scott rejects the label of “conspiracy theory” and coined the phrase “deep politics” to describe his extensive investigations into the role of the “deep state”. In this 2015 interview, Professor Scott discusses the deadly programs [ starting at 10:25 https://www.youtube.com/watch?v=-QH9yOzhkio ] of the American Deep State. “the oil companies are behind the special relationship that America has with Saudi Arabia and the United Emirates. It used to be with Qatar but that seems to be â€“ Qatar and Saudi Arabia are at odds with each other because Saudi Arabia is really terrified of radical Muslims and they have good reason to be. They have a large Shia population. Qatar isnâ€™t because itâ€™s a tiny country and they have the goods on everybody. I suspect weâ€™ll find thereâ€™s a much stronger connection between Qatar and ISIL. Weâ€™re pretending that theyâ€™re part of the alliance against it. I am 55 years old. I cast my first vote at the tender age of 19 for Ronald Reagan in 1980 and never looked back. Until now. National politics is nothing but a rigged game run by greedy, corrupt, duplicitous, manipulative, power hungry politicians, lobbyists and billionaire Elitists. Frankly, I don’t even care who wins the presidency as long as it is either Sanders or Trump. No one person is going to go to Washington and “change” it. It is beyond redemption, so I’m just looking to stick my middle finger into the gears of the “Machine”. If the definition of insanity is doing the same thing over and over but expecting a different result, then this nation-wide farce we are all engaging in is sheer lunacy. Wake up America. Real change demands courage, fortitude, and plain hard work, but it is possible. I would invite all Americans who still have some common sense and intestinal fortitude left to learn about Article V, the Tenth Amendment, and the Convention of States. It’s the only way the American people have a prayer of chaining the beast known as the Washington Establishment. The energy in the movement not to allow “big” money to determine who gets elected and what they do once the benefactors get in office seems to ebb and flow. Most of us don’t want to deal with the issue, to be sidetracked from the entertaining aspects of the competition between candidates, to formulate in our minds an agenda for change. There is the World Series, the Super Bowl, March Madness, the Kardashians, et al to keep our minds off of reform, convinced that what we do will make no difference anyhow. While we, the mass of citizens, are often looked upon as too stupid to discern issues of national importance, we are instead simply too busy and what is the difference anyhow. The point there needs to be a reawakening of our civic responsibilities, to carve out time to begin the tedious task of grassroots support to make the governments work for us. Being too lazy is too simple an explanation but somehow there needs to be way to make civic duty part of our everyday lives. While pleading guilty, it seems that there must be a way to get people to engage, and for the people to get satisfaction out of such engagement. ticians may serve time there. before the war on you? There won’t be an oligarchy if we return to and enforce the original Constitution and The Bill of Rights. If one assumes that elections are not already controlled by money, such expedients would certainly be part of a solution. 1. So far nothing has been done to financial fraudsters because they are the bedrock of financial support for oligarchy reps, who of course agree with them. 2. The gangs and tribal forces are the economic oligarchy, and of course they vote as they believe, especially with the ill-gotten so sacred in their beliefs. 3. Jill Stein one hears of far less than Sen Warren who knew it was hopeless. 4. Gitmo or other prisons for the oligarchy would be fine but no such enforcement is possible. One would have to replace every politician, judge, and half of federal employees. The problem is exactly that elections and mass media are already controlled, so all of the preferable solutions, nice clean operations of a society which is not already irretrievably corrupted, have not can cannot work. Your final assumption, that a revolution must be as corrupt as those it replaces, is not arguable in the light of history. Usually revolutions achieve only incremental improvements, but over time they have worked. For example the US revolutionary war. But ours has failed at last due to the emergence of economic concentrations. Which is not to suggest that history needs only one more upheaval to avoid the “self-organizing” seekers personal gain through corruption. The US has in fact suffered a right wing revolution against democracy, and democracy has lost. So our only real hope is another forcible suppression of the savagery of greed, this time establishing a Constitution that regulates economic influence upon government, and other corrupt uses of economic power. Surely you do not proffer the shards of democracy to the people as signs that it still exists. Surely you do not credit all that is right about the US to those who are all that is wrong with the US. Surely you do not seek to threaten those who would reform with the vengeance of those who have corrupted. Re-reading your comment, I’m glad that I said “surely not,” for I see that you do not imply such things. It is a good point that the mechanisms by which money dominates the institutions of democracy are self-organizing. This avoids sketching details of collusions or hypothesizing central control mechanisms. Large economic concentrations emerged since the Constitution was written, and so it has no mechanisms at all to protect democratic institutions from money. The US is completely vulnerable to all of the well-known vices and corruptions of government throughout human history, despite the best efforts of its founders, because these are now manifest in the domain of economic power rather than the raw coercive power so nicely regulated in the Constitution. Money is the new domain of all the government evils that ever were, the terminal disease of democracy. The most ancient and savage gang organizations and tribal processes are back in full force. We have nothing left but conspiracies of savages to guide us. The abuses of economic power are concealed from the people precisely because it already controls the mass media and elections, the fundamental tools of democracy. So no political change, such as amendments to restrict funding of mass media and elections, will be allowed to be broadly considered. But it is helpful that websites such as this one can provide understanding to those who have never considered the problems. I fear that the only way out of this is war upon the oligarchy, which likely will be great, savage, unfocused, and protracted, nothing that anyone could advise. But I would not stop it. The US has a terrible lesson to learn about corruption, and the sooner the better. Interesting that the author applies the title of molecular biologist Jacques Monod’s book, “Chance and Necessity,” published back in the 1970’s to explain biological evolution at the molecular level, to evolution of the American economy and government. And, why not? From the sub-cellular to the societal levels, all comes down to how information processing systems (entities from cells to entire countries) come to be regulated through intricate feedback loops in their environmental milieu. I wonder if Lofgren is familiar with Monod’s work (Monod was co-discoverer of the “operon,” a model explaining transcriptional control of gene expression), or if his usage of the expression was pure serendipity?